You are currently browsing the tag archive for the ‘Don Miguel Ruiz’ tag. All of my life, I have either been over weight for FELT like I was over weight. Why? Because my mom told me I was fat. My dad told me I was fat. My brothers told me I was fat. And the kids at school told me I was fat. When I look back at my high school pictures, I see a completely different story; I was gorgeous!!!! I have spent my entire life believing this story. Which means I have spent my entire life (from time I became a teenager to now…at nearly 41 years old) on some kind of diet or thinking about being on a diet or thinking about how fat I am or that I would feel so much better if I was thinner. I would say that I became conscious of my body shape and size at the age of 5; 36 years is a very long time to not like yourself/body image, don’t you think? To try to change things I have been on numerous diets. As a teenager, I would take dexatrim like it was candy. I would binge eat then exercise like crazy to work it off (exercise bulimia). As an adult, it started with “Medical Weight Loss Plan”. I lost 60 pounds on that, I think. Then I joined Jenny Craig; didn’t do so well with that one. Then I took Phen/Fen; thankfully my heart was unaffected. Then I tried just the “good” part of the Phen/Fen; that didn’t work at all. Then I did Weight Watchers…..twice. Then I just did my own thing; eating healthy and exercising; it worked great. I even saw a therapist. I felt great. I even became a Beachbody Coach and started selling workout systems and coaching other people. Yet, I gave up the eating healthy part and even my exercise routine has dropped. I have gained back 10 of the 40# that I have lost. Now what????? This is where the email from Oprah came in. She suggested everyone read Women Food and God. Now I’m not one of those people who drops everything and does what Oprah says to do. But this one intrigued me. Probably because I was already on my 52 books in 52 weeks journey; and this book sounded interesting. Besides, it might actually help, right? So I ordered it….. I have to be honest and say that before I started reading the book I felt pretty jaded. What is a book going to say to make that much of a difference in my eating/weight issues? I have been through almost every diet out there; at least every type anyway…except surgery (and that is only because that scares the heck out of me). But I read it anyway… And what I found was spot on! This book is such a worthwhile read. It’s not just for those of us with weight/food issues. It talks about Compulsive eating, but I think this book would help anyone with any kind of compulsive behavior like smoking or drinking. One of the biggest concepts this book talks about is “Bolting”. “Buddhist teacher Pema Chodron writes, ‘Never underestimate the inclination to bolt. '” Bolting; this is something (I realize now) that I have learned from my father. Whenever the going got tough, he ran. He ran from churches, from places of employment, and from his emotions. Me? I have bolted from friendships, emotions, and sometimes even volunteer work. When things don’t go my way, I have been known to throw a temper tantrum and run. How does this pertain to food? Well, when things go bad, I like to eat..and eat alot! This is “bolting”. It’s the way we run from our emotions or “stuff” them as some people say. Instead of staying present and feeling what we feel, we “bolt”. This was a huge Ah-ha moment for me. I have done this alot in so many ways. But it stops here! Roth says it’s not about the weight. We spend so much time in what she calls the “When I Get Thin (Change Jobs, Move, Find a Relationship, Leave This Relationship, Have Money) Blues”. We wait for something before we start living our lives. I am so guilty of this. I say, “When I get down to my perfect size, I’m going to jump out of a perfectly good airplane.” Well you know what? I can do that now. Sure, I will pay a bit more, but I can do it now! I don’t have to wait! What does jumping out of a perfectly good airplane represent to me? Freedom. When I say I will do it when I lose my weight, I am saying that I am STUCK. Well I’m not stuck, and what a horrible story to tell myself. My weight may make it uncomfortable to do things, but it certainly isn’t going to stop me from living a full life! And it shouldn’t stop you! Yes, get healthy! Yes, use food as nutrition to fuel your body. But STOP putting things off until you get to whatever it is you think you want to get to. This kind of thinking has you believing that you are not worthy of your dreams right NOW…and You are..I am.. WE ARE!!! Start living today..stop waiting for that perfect time. If we can start living today, the rest will catch up! This is what I was saying earlier. Until we understand who we are and what shapes our beliefs, our body will not change. We need to understand what is making us run, hide, stuff and eat compulsively. The same can be said for alcohol, drugs, smoking…….. “Truth, not force, does the word of ending compulsive eating.” We can’t force it with a strict diet, by counting points, by eating premade frozen meals, by taking shots, or swallowing pills. We must find the truth..by being curious, by inquiry. Asking ourselves, why we feel like eating. What is that food going to “fill”. Where in our body are we feeling? What does it feel like? What color is it? Once we can recognize this, give it a name and sit with it in truth instead of trying to run from it or stuff it, we will realize that it’s not going to kill us..and guess what..we don’t want to eat anymore! Just when you think you don’t want to feel those things that hurt, comes this quote from Roth: “the medicine for the pain is the pain.” Last weekend, when I did a Firewalk, I heard myself say, “you need to feel the pain.” So I let myself feel the hot coals beneath my feet. Walking fire can be “easy” and painless, or you can choose to make it hard and or feel the pain. I chose to make it easy AND feel the pain? Why? Because I need to feel the pain in my own life. I need to recognize when I feel sad, lonely, hurt and FEEL it instead of stuffing or bolting from it. One of the ideas in this book also blended well with The Fifth Agreement by Don Miguel Ruiz. Ruiz says to listen and be skeptical. He was talking about doing this with others, but you should also do it with yourself. According to Ruiz, we have been “domesticated” from the time we were children. It was important to be thus so that we could learn not to put our hand on a hot stove. We were domesticated for our own safety. But these teachings also went further than this. These teachings also taught us who we think we are based on someone elses’ perceptions of who they think we are. Roth suggests the same kind of thing with the practice of Inquiry. Be still and listen..be curious..ask..but don’t believe everything you hear. Remember that what your mind tells you is what you have learned from the past..from other people.. Inquiry is body based. What is the Body feeling..not the mind. Listen..and be skeptical. Roth calls this banter inside our heads “The Voice” (what Ruiz calls domestication). The Voice has been running our lives. Telling us that we are fat, our thighs have too much cellulite, we are quitters, we are losers..yadda yadda yadda. Those are lies! We are so much more than that. We are the very essence of GOD; we are LOVE and JOY. When The Voice talks, tell it to shut the heck up! And get back to feeling what you feel in your body. 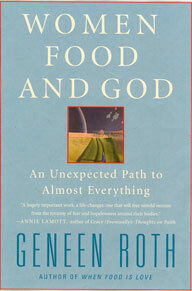 Another practice Roth suggested in this book is to meditate…..ON YOUR BELLY. Think about what you belly feels like. Now I know that as women, we try very hard NOT to think about our bellies.. But if I told you NOT to think about your belly, what is the first thing you think about? YOUR BELLY! So instead of pretending not to think about it, embrace it. Your belly is your place of personal power. It is your 3rd Chankra..your solar plexus. This is what balances you and gives you power to speak your truth. You NEED to focus on it, and love it and listen to it. It is where you intuition resides. It is an amazing part of your body, and by ignoring it, you are mistreating it and yourself. You deserve better than that :). There is so much more to this book than what I have typed, and I have typed ALOT! She goes on to talk about whether you are a Restrictor or Permitter when it comes to food (or even life). She goes on to talk about the Sufi’s 3 ways to God and how that pertains to our eating. And she gives us her Guidelines for eating, remember that you can eat anything you want and still get to your NATURAL weight. To learn more about these, you will want to read for yourself. I just can’t do it justice. But I will leave you with a couple of quotes….. This book is the follow-up to The Four Agreements also by Don Miguel Ruiz. When I opened the book, and saw that it went over the first 4 agreements again, I thought “Wow! This is going to be a long re-read!” I was completely wrong. Yes, it went over the first 4 agreements again, but it gave me new insights. This is always a welcome treat. Have you ever had a book where you love almost each and every word you read? It’s like each word has a direct link to your heart and means so much more than the paper it is written on? That is this book! Almost every page is dog-eared and has notes written on its pages. I love the quotes that can be pulled from this book as well as the huge insights and awakenings it gives! You won’t be disappointed! I am pretty certain I have said this before, but I have always felt that if we just listened to each other’s stories, World Peace would be a reality. Well the 5th Agreement is just that! Be skeptical, and listen! Listen to each other. You don’t have believe what they say or share their believes, but LISTEN. You will find out where they are coming from and why they act the way they do. You will UNDERSTAND why they are different from you and maybe even find out that they are the SAME as you! Listen, but be skeptical. I loved this! You existed long before you understood all those symbols, before you learned to speak, and just like any child before he or she learns to speak, you were completely authentic. You didn’t pretend to be what you are not. Without even knowing it, you trusted yourself completely; you loved yourself completely. Before you learned knowledge, you were totally free to be what you really are because all those opinions and stories from other humans were not in your head already. We knew bliss once before as a child. Before our parents and society told us what to believe about ourselves and the world around us, we knew we were perfect. We were thrilled with ourselves. We had no reason to believe we were anything other than amazing! We experienced bliss every single day of our lives! Before knowledge, there is ignorance…and IGNORANCE IS BLISS! Once we let go our attachment to this “knowledge” we will find our way back to that bliss :). Everything about us is perfect, including any disability or disease that we may have. Someone with a learning difficulty is perfect; someone born without a finger or an arm or an ear is perfect; someone with a disease is perfect. Only perfection exists, and that awareness is another important step in our evolution. PERFECT!!!! It’s not enough to say this, but we need to BELIEVE IT!!!! I believe it, do you??? I will leave with this thought. Gandhi said, “Be the change you wish to see in this world.” This is something I remind myself on a daily basis. If I want my children to be a certain way, then I must model that for them. Ruiz says, “When you’re happy, the people around you are happy too, and it inspires them to change their own world.” My passion and mission in this life is to be of service and change the world through my service. If you want to change the world, start with yourself. Be the change you want to be see in this world, and the people around you will follow. Change/better yourself = change/better the world. Thank you for reading my blog. Even if you don’t comment, I see that you are reading, and that means the world to me. This journey is mine, but it is also yours. We are walking this path together and together we can accomplish anything! So thank you! This is one of my favorite books. I first read this so many years ago that I can’ t even remember how long ago it was! Since it has been so long ago, and I have gone through so many changes since the last time I read it, I decided it was time to read it again and learn it all over again. It’s time to reclaim my power the Toltec way. So what are the Four Agreements? Be impeccable with your Word. Don’t take anything personally. Don’t make assumptions. Do your best. To me this simply means, “Say what you mean; mean what you say.” Yet it goes a bit deeper than that as well. Watch your words. What you say about yourself (even in jest), you will believe about yourself. What you say about others is just a reflection of what you think about yourself. So if you are telling a friend that you think another friend is useless or ugly or mean or bitchy, what you are really saying is that YOU are those things. You are rejecting yourself. You are sinning, and tearing yourself down. Your word is how your create your life, your thoughts, your dreams, you intents. It is pure magic. It is your creative energy put into action. Be careful..be IMPECCABLE with it! You might laugh and say, “well that’s hard if not impossible”. But it can be true, and it is so very important. I am not talking about the gossip you heard about yourself from a friend of yours; I’m also talking about the GOOD things you hear about yourself. Don’t take ANY of it personally. What you hear about yourself from other people is THEIR perspective/version/dream of you and how you fit into their world. It is not YOUR TRUTH. The other day, while I was watching the Oscars, I thought about how amazing it would feel to have someone stand up in front of millions people (okay, I would be happy if it was just in front of my family and friends) and sing my praises (like they did for the nominees for Actor/resses in Leading Roles). Those speeches were so beautiful. I thought that unless you win some type of award, you usually don’t hear these things until someone dies praises are sang during the Eulogy. I wanted someone to sing my praises to my face BEFORE I die. *laugh* Wouldn’t that feel amazing? I also remembered an exercise I had to do while attended a James Ray seminar. We were told to write an introduction for ourselves that would be read at an awards ceremony….like the Oscars. So I wrote this amazing speech about how amazing and successful I was/am. And I wrote my acceptance speech as if I won this award. These pieces would be voted on by the workers at the seminar and 3 winners would be introduced with their speeches by James Ray at the awards banquet. Sure enough, I was one of those people that he introduced. Hearing my own speech made me cry. Feeling the love and support from that standing ovation was like no other feeling I have ever had. It was awesome. Yet, here I was watching the Oscars and wishing someone ELSE would write this speech about me and give me some kind of award. *laugh* Then I read this part of the books again. Don’t take anything personally! Not even the good stuff! So now what? Ruiz tells us that we create our own movie! We are the director, producer, main actor/ress of our movie…everyone else is secondary. What other people think just doesn’t matter! Our point of view is personal to us, and its no one’s truth but our own. As long as we pay attention to our own movie, speak impeccably about ourselves…that is all that we need. We don’t need other people to write those introduction speeches. We should just write them for ourselves! Believe me, just writing them and feeling that feeling of endless possibilities is a very powerful experience! When we stop listening to other people’s opinions about us..we we stop giving them the power over what we believe about ourselves, we let go of fear and negative feelings. “We can say “I love you” without fear of being ridiculed or rejected. We can ask for what we need and feel free to say yes or no to people’s requests without guilt or self-judgment. We can choose to follow our heart…all the time.” How powerful is that?! But have you heard this, “All the sadness and drama you have lived in your life was rooted in making assumptions and taking things personally”? Ya, I hadn’t either until I read this book. This may seem overly simplistic, but it is so true. “It is always better to ask questions than to make an assumption, because assumptions st us up for suffering.” So why don’t we ask questions? We are afraid of being told “no”. We are afraid others will judge us, abuse us, victimize us…like we do to ourselves. It seems so easy on paper. I teach this..”Ask for what you want” in the self-esteem classes I teach to young girls. Yet it is hard. We have been “beat into submission” or Ruiz calls it “domesticated” by our parents and society to be/think/feel/act a certain way…this includes fear of rejection. But by living these new agreements, we learn to stand on our own two feet and change our dream. So here is an example of this. This morning, my daughter (Omi) get’s up and gets dressed for school, then she lies on the couch under the blanket until it is time to go. Then she gets up and brushes her hair and teeth and puts her shoes on. And we are off to school. When I get to the end of the road, ready to turn onto the major street, she realizes I am about to turn left and head to school. She was hoping and ASSUMING I would turn right and head to the convenience store to buy her breakfast first. So instead of being assertive and asking for what she wanted, she made an assumption. When she saw she wasn’t going to get what she wanted she said, “I guess I can live without breakfast.” I asked her to repeat what she had said. Then I reminded her that she had been laying on the couch for at least 30 minutes..plenty of time to get up and make herself a bowl of cereal (which we had plenty of at home). But she chose not to, in hopes that I would take her to Maverick. I let her know that if she had wanted to go to Maverick, she should have ASKED me and not made the assumption. Because now, she is not going to have breakfast and will likely be hungry all morning (suffering). I told her that all she had to do was ASK, but the answer might have been “no” because we had food in the house to eat. And hearing NO would have been okay, but make the assumption is NOT okay. It is our right to ask for what we want/need. But is also the right of the person we ask this of to say yes OR no. Then it is up to us not to take ANY OF IT personally. There is true freedom in this! How many of you have said or heard, “It’s not about whether you win or lose, its how you play the game.” Well its true! This agreement is probably the most important one out of all of them. While we live our lives, we are bound to make mistakes. While we are changing our agreements and changing our dreams, we are bound to make a mistake. We are bound to speak out of turn and not be impeccable with each of our words. We are bound to have hurt feelings by something someone said or feel our heads get a bit bigger at a compliment. And (as a married woman) don’t even get me started on assumptions! But as long as we are doing our best, things will get better! We are going to make mistakes. So recognize them, and then tell yourself, “tomorrow is the start of a new day.” Or, “From now on, I will be impeccable with my word.” Pick yourself up and move on. Forget about the past, don’t worry about the future and focus on THIS moment. This moment is all that we have. We can choose to live these new agreements in each moment of our lives. If we mess up..guess what, there is always the very next moment to start all over again..FRESH! JUST DO YOUR BEST! Also, realize that doing your best in this moment make feel different that doing your best in the next moment. If you are a morning person, your best is gonna feel alot better than the best you give in the evening after a long day. That is okay, as long as you are giving your best in each moment..whatever “your best” looks like! Be grateful for each moment and realize that with each breath (each moment) you have the opportunity to direct your own personal movie and change your dream! It’s up to you! P.S. 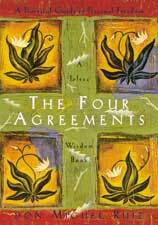 Stay tuned..my next blog will be on Don Miguel Ruiz’s The Fifth Agreement. 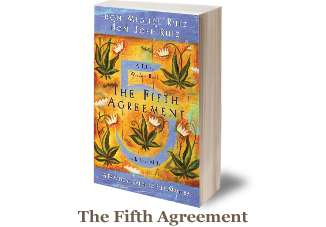 I have never read this before, and I am excited to hear what the 5th agreement is!! !